Does Bad Music Chase Away Good Catholics? There is a good discussion happening at my lead essay today at InsideCatholic. A few crisis Catholics are wondering if the whole thing was some kind of stunt. Surely they must be pulling conservative legs to be bringing in me to actually defend the three to five percent of G&P that has turned out well. Church attendance has declined ~65% since the actual (vs. intended) liturgical shifts since the 1970s. We hear numerous explanations covering a wide front … I’d like to add a simple suggestion to that incomplete list: the music. Has anyone ever left the Church because of poor music? I have no doubt it happens every day. But let’s get some perspective. Post-conciliar parishes that had “folk” music, usually had one Folk Mass. Period. There were a lot of guitarists springing up in the 60’s, but not enough to staff a whole parish music program. I don’t doubt that some genius pastor somewhere found out that he could fire the sister doing the music and get volunteers to do it even more cheaply. Or more likely, as religious drained away from parish life, lots of music directors who also happened to have given religious vows drained away, too. Steve Skojec and other apologists think as if chant binders were tossed into the Easter fires of the first Vigil under the new Mass. I just don’t think it happened that way. If a parishioner didn’t like the 11:00 liturgy turned into the Folk Mass, she’d just go an hour earlier or an hour later. The notion that musically starved American Catholics yearning for chant and polyphony had nowhere to go is sheer mythology. First, it was the rare parish outside of religious life that had a good music program. Second, there were always options at the parish, or in the neighborhoods of large cities. Sociologists studying Catholic trends are pretty much convinced that Humanae Vitae was a last straw of sorts for people disgusted with the institutional church. I don’t see conservative tears shed for those awful dissenters abandoning the ship. These kinds of musical discussions do get heated and passionate. So often people have their minds made up, usually in the mold of the latest reform2 guru. Facts will be bent to best fit the opinion. I saw it with some of my progressive colleagues in the 80’s, so I chalk it up to human nature. 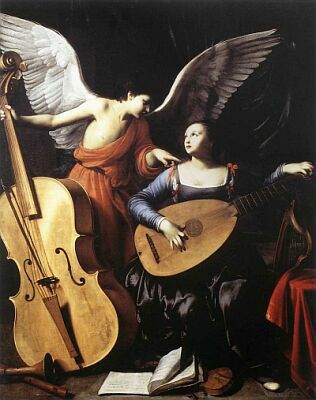 By the way, Saint Cecilia really knows how to play that lute, doesn’t she? 14 Responses to Does Bad Music Chase Away Good Catholics? One could also argue it’s just *music* that drives some Catholics batty. You see a certain minority of people who wonder resentfully: why can’t we just have Mass without music? They appear to believe the whole arc of the last century towards reviving the norm of the sung Mass was basically misbegotten. Does it chase away catholics? Yes indeed! Good ones? Not really. As I always say, there are people who travel far and risk execution for attending Mass. If we have to put up with bad music, it is a blessing. And yet, I’ve always felt chased away by the Church. I have had people literally try to chase me away. I am in correspondence with many other musicians who are terribly deadened in spirit by the music we are expected to perform for the modern American church. And let’s not forget that bad music and liturgy does damage. Sing faulty doctrine long enough, and you’ll start believing it. Attend an irreverent liturgy and it does damage. I can point out my own example: a guest priest visited and started off the Mass with the American Introductory Rite: “Goooood morning!” Expecting this after the early Mass, I belted out “AMEN! Whoops!” That was, without question, an act of profound irreverence. And yet if my priest, or any of his usual substitutes, were to make a mistake or something in the liturgy I wouldn’t loudly poke fun at him or even giggle about it. This priest had a way (with sooo many other abuses) of sending the definite psychological signal that the Mass is not important and that irreverence is encouraged. Perhaps we shouldn’t think of those who leave the Church but rather the formation those who stay in are receiving? I should add that good music brings people to the Church. My parish had a Catholic iconographer come and speak whose conversion from agnosticism happened when he stepped foot into the London Oratory. We all know stories like that. But whom do we know who converted for Glory & Praise or Gather? I can’t think of one person. Another way to look at this is perhaps that it’s not so much a question of bad music vs good music but mediocre music vs good music. Yes, there is some bad music used liturgically. But, more commonly, it’s just mediocre (either in composition or execution or both). And enduring mediocrity in art is almost an American civic religion. Heaven knows the last thing we’d want to be thought of as is snobs. Badness usually is sifted out over time. Not necessarily mediocrity – mediocrity has longer legs when it has industrial strength behind it. Just keep that in mind. There is the quote of the week. I would like to add something to this: St. Augustine said that God reaches people through four ways–goodness, truth, unity….and beauty. Different people will be attracted to diverse things. Those who are drawn to God by beauty might indeed walk away from the Church because of bad music. I have known some of these people, and some of them were good Catholics. This is, in my mind, a definite problem, and one that can only be fixed when people admit that much music in Catholic parishes is in fact mediocre, no matter which hymnal it comes out of. Michael, it’s a vicious cycle: American church music is mediocre because no one cares to put in the effort (joining choir, paying for a musician). And no one cares because American church music has always been mediocre. But whom do we know who converted for Glory & Praise or Gather? I can’t think of one person. I can think of several, and can think of several who left because of the attitudes of choir directors who hated Gather and made their contempt clear. FWIW, I have never found the organ or chant particularly pleasant, and avoid churches that use them extensively. That said, I”m not there for the music. Not sure about “always”. Some may think just prior to Vatican II that things were great musically. That was not the case. The liturgical music in many parishes was indeed mediocre at that time as well and much of it was “performed” for arts sake and no other purpose. To believe otherwise is naive. I think the statement you quoted expressly validates the idea that the music before Vatican II was widely mediocre, too. “Always” is the key word – it covers both before and after the Council. I hope that makes you feel more sure about that word. Yeah, I was confused about that too. I’m the biggest basher of pre-Vatican II times around. I just view the modern mess as an extension of the mediocrity before the council. As I always say, if you want Vatican II, you need chant and Latin. If you want to stay in the “dark ages”, stick with poorly trained musicians singing sentimental and poorly-written music “led” by a cantor. As I always say, if you want Vatican II, you need chant and Latin. If you want to stay in the “dark ages”, stick with poorly trained musicians singing sentimental and poorly-written music “led” by a cantor. Gavin, it was the chant and the Latin language that was expressed poorly before Vatican II. I don’t think we’re on the same wave length. There was no “cantor” in the “dark ages” (whatever you mean by that). The great choral conductor, Robert Shaw, once commented: “…once in awhile, a noble text, and a noble piece of music, are destined to meet on a higher plane…” Unfortunately, that doesn’t often happen in the Catholic Church. Not so. My parish had a very good music program that blended the traditional with more contemporary works. Now it’s just folk music and rock n’ roll church with everything in unison — but no cool chants of course. Maybe I am a bad Catholic, but music is how I pray. I need the polyphony. I need to find a place to sing my worship.